I’m not one for diamonds and chocolate but Champagne I can rarely say no to. Champagne has been in the news a lot over the last few days. The region was recently confirmed as a UNESCO World Heritage Site. Now that’s a biggie! So to spread the love, here’s a chance to get your hands on a bottle and celebrate along with #winelovers around the world. But this isn’t just any Champagne. DEVAUX is a famous producer of the French bubbly, and has just made its way to Indian shores. Devaux (pronounced the-voe) brings with it everything that I love about the world’s favourite fizz. It is chic, elegant and has enough complexity to keep you hooked. The boutique house was founded in 1846 and has been making premium Champagne ever since. There are three variants that are being imported now – Cuvée D, D Rosé, and Ultra Brut (extra dry). We’re giving away a bottle of their flagship Cuvée D and here are a few things that make this wine special. Of the 3 grapes allowed in the Champagne appellation, Devaux uses only 2 – Pinot Noir and Chardonnay (Pinot Meunier is the third). At 8gms/l of residual sugar it is on the drier side of Brut, which means that you don’t have to feel too guilty about the extra calories. Finally, one of the most interesting things about Cuvée D is its maturation process. While most Champagnes spend a little over a year ageing with the yeast before they are disgorged, the Cuvée D is aged so for 5 years! This makes the wine more complex with lovely biscuit-y, toasty notes, and yet it is wonderfully fresh and vibrant. A versatile wine, it works brilliantly as an aperitif but also pairs well with most cuisines. The Devaux Cuvée D Brut is priced at Rs 6,010 in Delhi. 1. After how long is Champagne Devaux Cuvée D disgorged? – Use the hash tag #MyDevaux in your Facebook and Twitter responses to be valid. – You must be above 25 years to participate. Sorry, kids. Ans2-Champagne Devaux will be a perfect gift for a holiday evening with Sushi & Grilled Sea bass. 2: Champagne Devaux will be perfect for ANYTHING! Once you have a glass of such bubbly, everything is a celebration. 2: Champagne Devaux will be perfect for my 30th birthday which is in a months time. Nothing goes with a milestone birthday cake like a lovely glass of bubbly! 2) Champagne Devaux will be perfect for – every reason and every season. 2.champagne will be perfect for my 50th birthday and 25th anniversary ..coming soon . 2) Champagne Devaux will be perfect for embarking on a new journey and celebrating an old one. Ans 2 – #MyDevaux will be perfect for my weekend wind down – a good bubbly paired with a bubble bath and a light and airy Dark Chocolate Mousse! Congratulations! 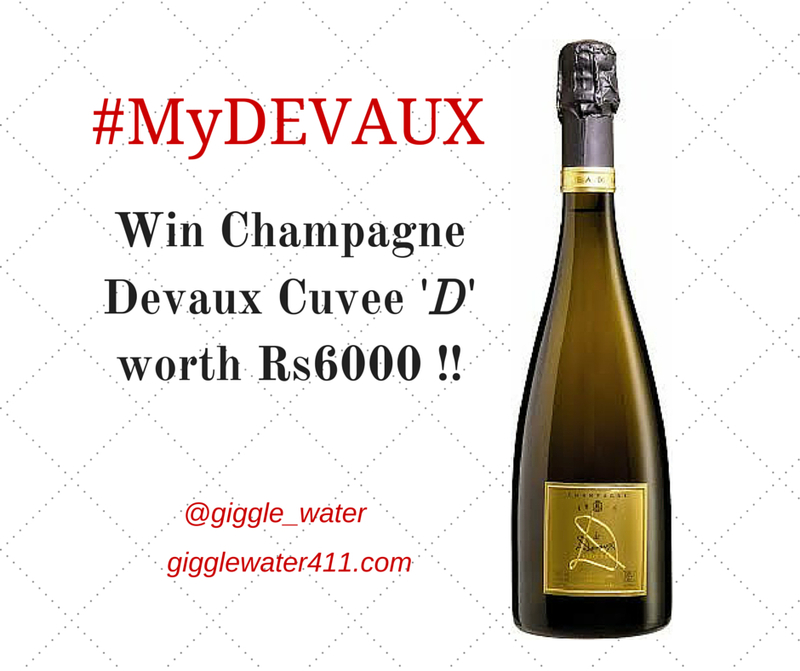 You win the #MyDevaux contest. Enjoy the bubbles and the bubbly. ← Wet, Dry, or Dirty: What’s your Martini?